XP Power today announced the publication of its new ‘Power Supply Guide’. 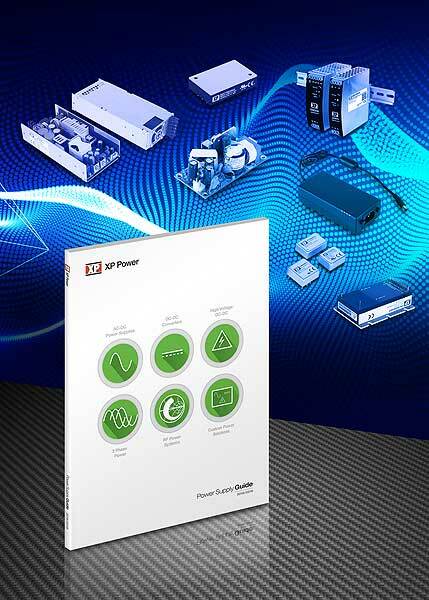 The informative, full-colour, 88-page guide presents XP Power’s comprehensive line-up of AC-DC power supplies, DC-DC converters, high voltage power supplies and RF power supplies, with key specifications for each product range provided in an easy to follow layout. The task of initial range selection is simplified by the product selector guide, which contains thumbnail images of each series organized by type and output power rating. XP Power’s customer power solution capabilities are also detailed in the guide. The complete range of XP Power’s portfolio is represented with AC-DC units covering the output range of 3 to 5000W, and DC-DC converters from 0.25 to 750W. Recent product additions covered in the guide include, a comprehensive range of high voltage DC-DC converter modules with output voltages from 100V to 10kV, in both proportional and regulated topologies for use as stand-alone modules or for integration into application specific assemblies. Also highlighted is the company’s RF power capability, offering RF generators and matching networks from 20kHz to 100MHz in a wide range of power outputs from 50W to 10kW and beyond, including frequency agile and pulsed applications. Also detailed is the significantly extended range of rugged DC-DC converters with approvals for railway applications. New AC-DC power supplies include the world’s smallest 40W open-frame unit, with a footprint of only 3.0 x 1.5”, and a series of ultra-slim DIN rail power suppliers offering a width of only 1.26” for 75W & 120 W versions and 1.77” for the 480W models. The guide also includes 3 phase power supplies up to 5kW, with up to 30kW available using parallel operation. For certain industries, compliance with specific standards is a requirement, throughout the guide a medical symbol is used to identify the many products that have a medical safety standard version, indicating their suitability for healthcare applications. In the AC-DC section an ITE symbol highlights products suitable for technology equipment. Additionally, products for defence and railway applications each have their own dedicated sections. The Power Supply Guide is available now and can be downloaded at https://www2.xppower.com/guide. A print copy can be requested online or by contacting a local XP Power office directly. XP Power also provides power supply selection applications for the iPhone and Android-based devices. These are available from www.xppower.com/Tools/App-Download.